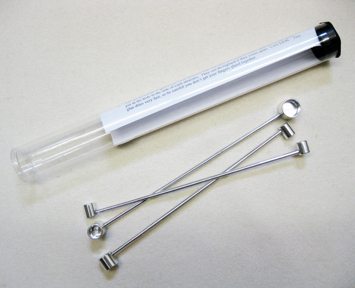 Amy Oxford Punch Needles in the most popular sizes. #14 and #10. 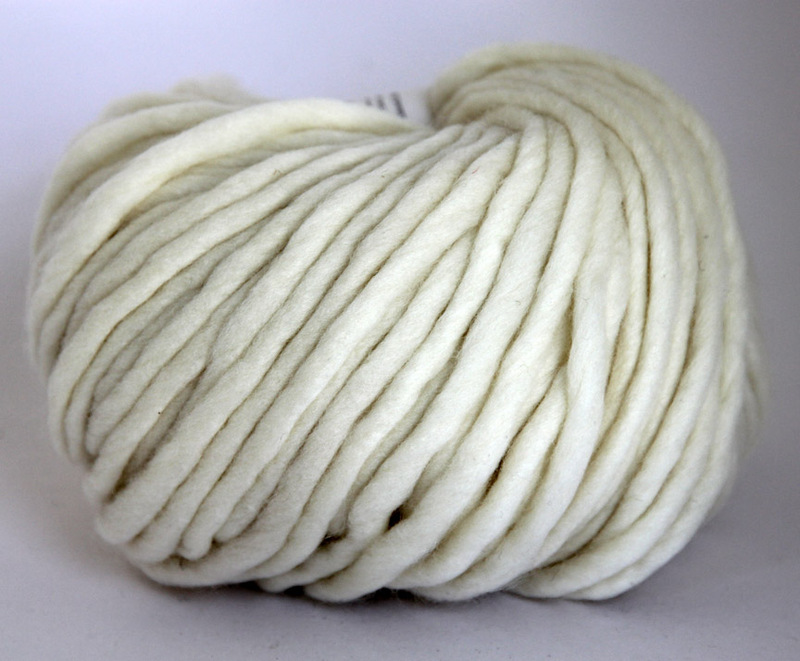 Perfect for the 2 Ply Yarn that we sell. Comes boxed with instructions. $42.95 ea. 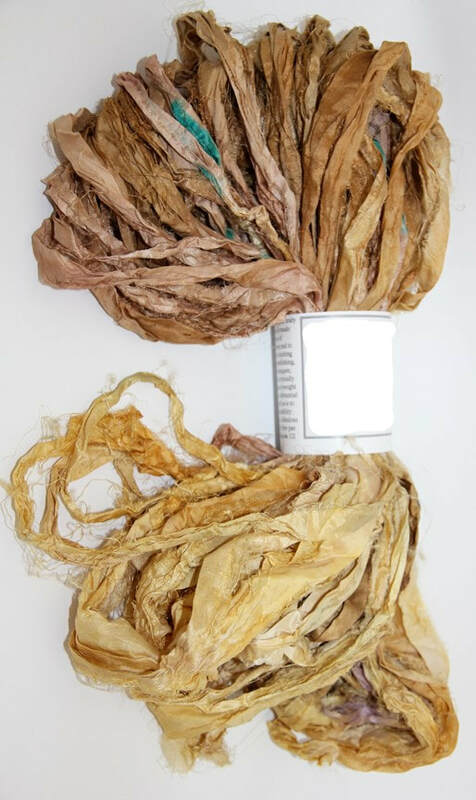 Strip Sizer Used to identify the size of leftover worms. Use to decide how many rows for filling in a large space such as a border. 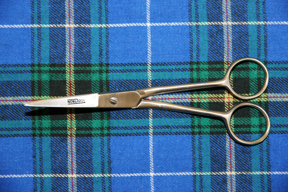 Use to measure for cutting wool with scissors. Made from 18 gauge cold rolled steel, powder coated, silk screened, etremely accurate in widths of each cut and made to last. $24.95 ea. 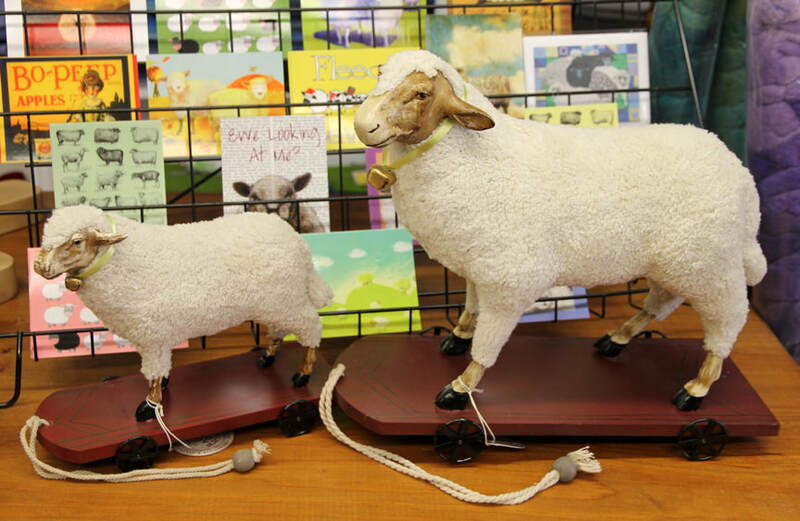 Beautiful sheep pull ornaments, lifelike and brilliantly finished with amazing detail. 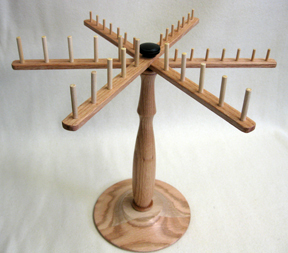 ​Sturdily made from wood and cotton. Made in Germany. ​If you love and collect sheep ornaments these are a must! SOLD OUT These are all labeled "Multi" approx. 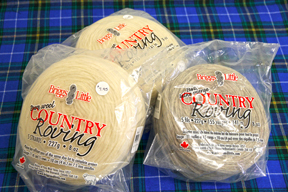 25 yards / 50 grams $10.95 ea. New and in time for Christmas giving! 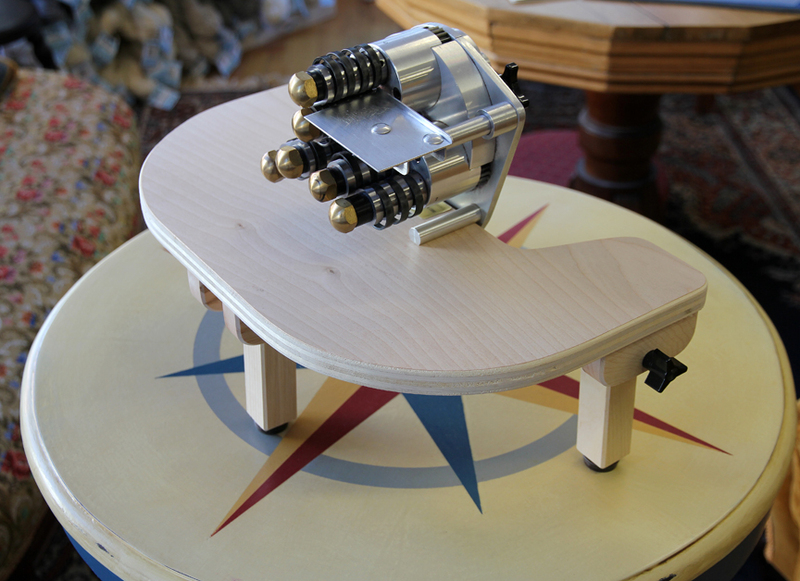 Portable cutter table. Folds easily for travel. Rubber feet for nonskid. Plenty of room to turn handle. Will take any clamp-on cutter machine. Demo showing my Bolivar. Perfect for when you don't have a table to clamp your machine too, at home, at workshops or a friends house. Can be painted on top or stenciled with a design to personalize. $69.95 ea. 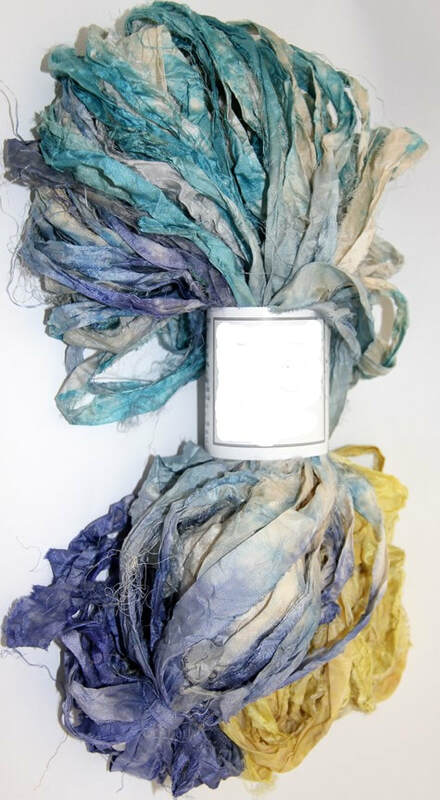 Recycled Silk Yarn - Content: Silk 100 yards/100 g 4-5 sts/ 1 inch $15.95 ea. 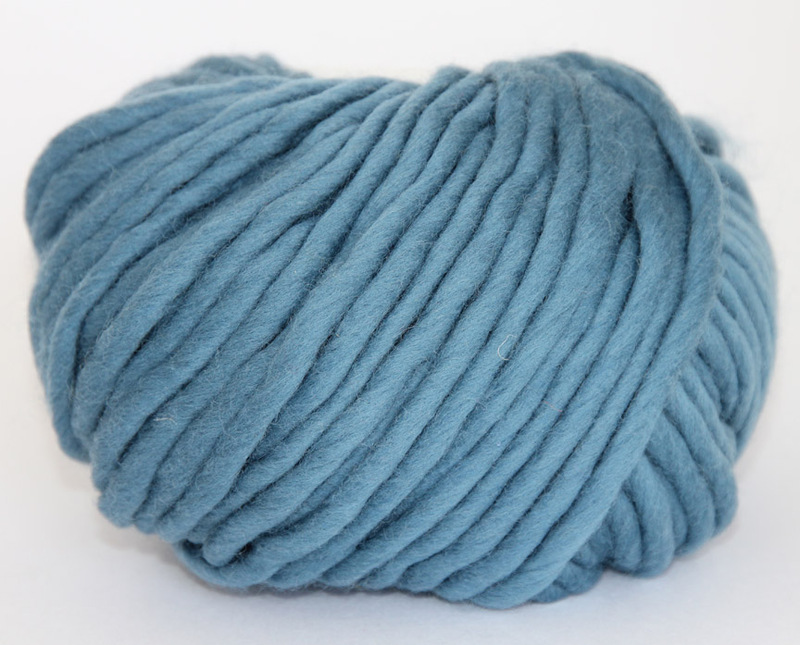 60% Superwash Merino, 30% Bamboo, 10% Nylon SALE 20% OFF $29.95 ea. The perfect organization for wool strips. Great for travel, convenient roll is compact and easily carried. 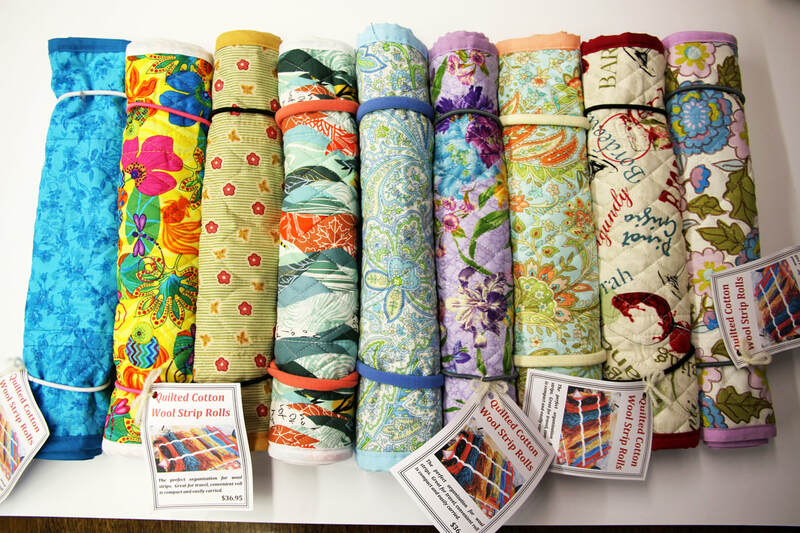 This will be an ongoing shop item but quilted fabrics will change with availability. The blue and autumn coloured Jacobean print is reversible so we are offering it with either the stripe or floral on the outside of the roll. There are two bands to wrap your roll to keep it from coming apart and snaps for segmenting various thicknesses of wool strips. (3) Butterflys & Flowers, (4) Abstract Orange/Green/White, (5) Powder Blue & Green Jacobean, (6) Colourful Irises with Lilac Background, (7) Peach & Robin's Egg Jacobean, (8) Wines in Red & Cream, (9) Pink & Blue Floral. $36.95 ea. 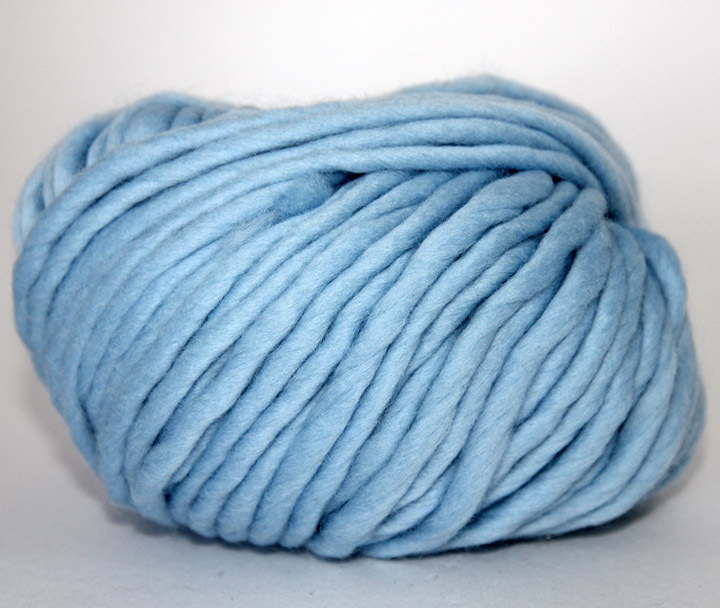 100% extra fine merino 3.5 oz/100 g 52 yards/48 m Perfect for water and sky embellishments. Clouds and waves! Don't forget sheep! Easy to hook! A bit of fun to leave behind when we join the hooking group in the sky. $5.95 ea. Call us toll free 1-855-624-0370 or use the Contact form for a PayPal invoice and we will take care of the rest! Any denomination and no expiry date. Coupon is for merchandise only, no cash value. *Just in, a floor model, cut wool, strip holder. 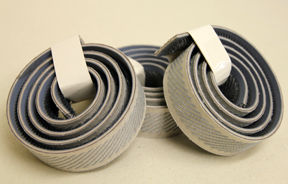 *Keeps cut strips organized, separated, and easy to select. 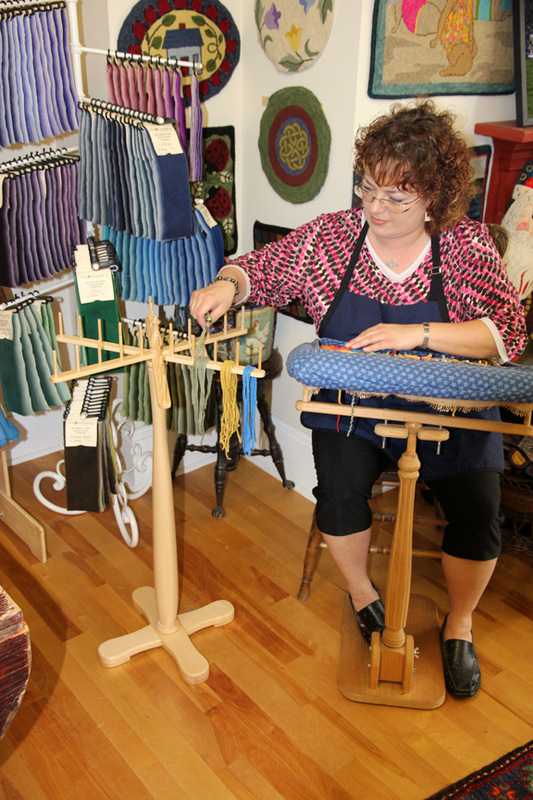 Generous height of dowels on each arm to really stack on piles of wool strips. 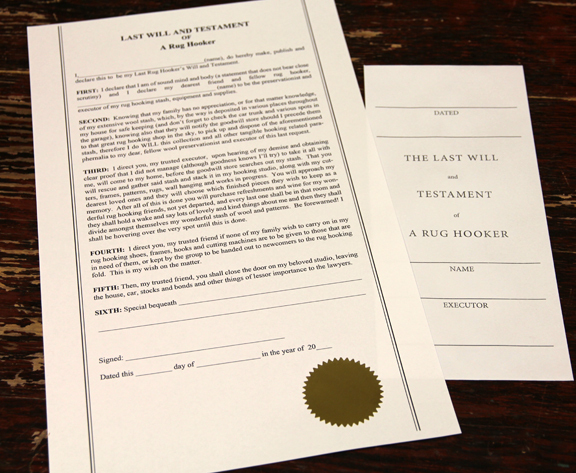 *No more mounds of wool on the coffee table or on the arm of the chair getting knocked to the floor. 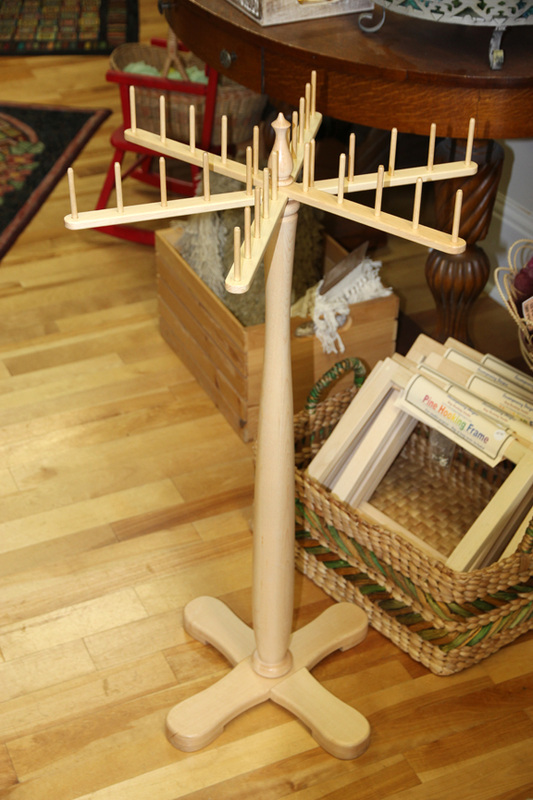 *This convenient stand is like a beautiful piece of furniture, a work of art! 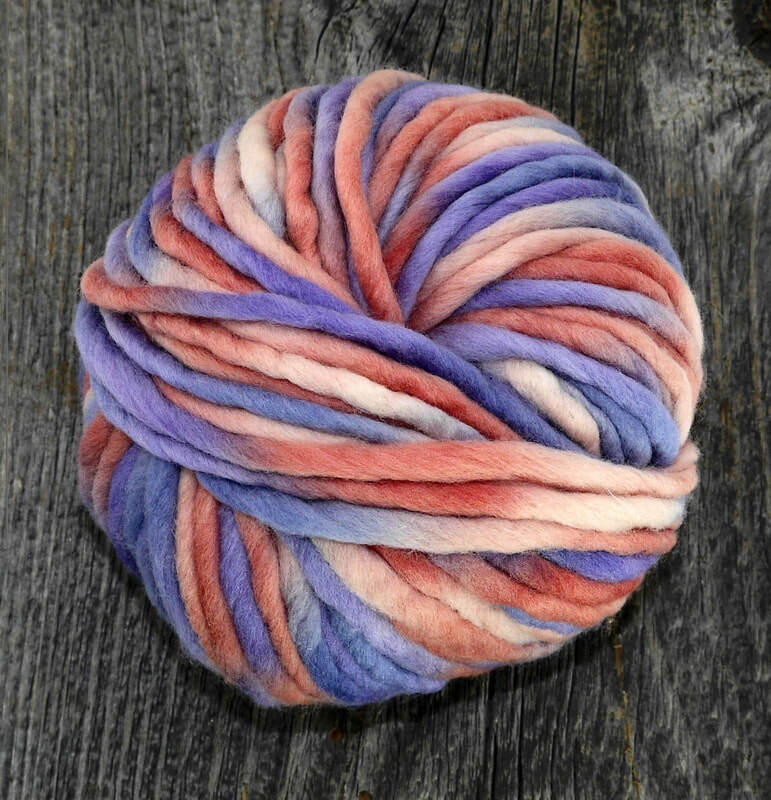 A hand-turned center spool and unique final top are all a part of its charm. The stand is extremely sturdy so it won't topple over easily. *As with all of Steven Scott's work, the wood is finished to perfection. The top and bottom can be unassembled for shipping in a long slender box. Top area is 20" across. Stand is 36" high to the top of the final. 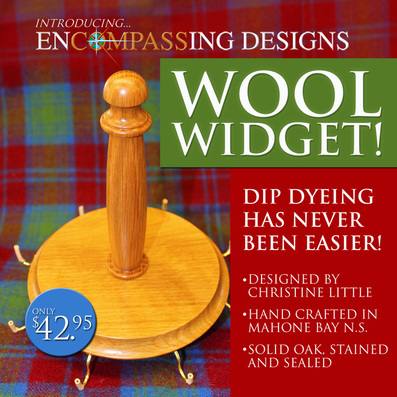 Encompassing Designs is proud to introduce the Wool Widget! The best little gadget since the wool cutter! 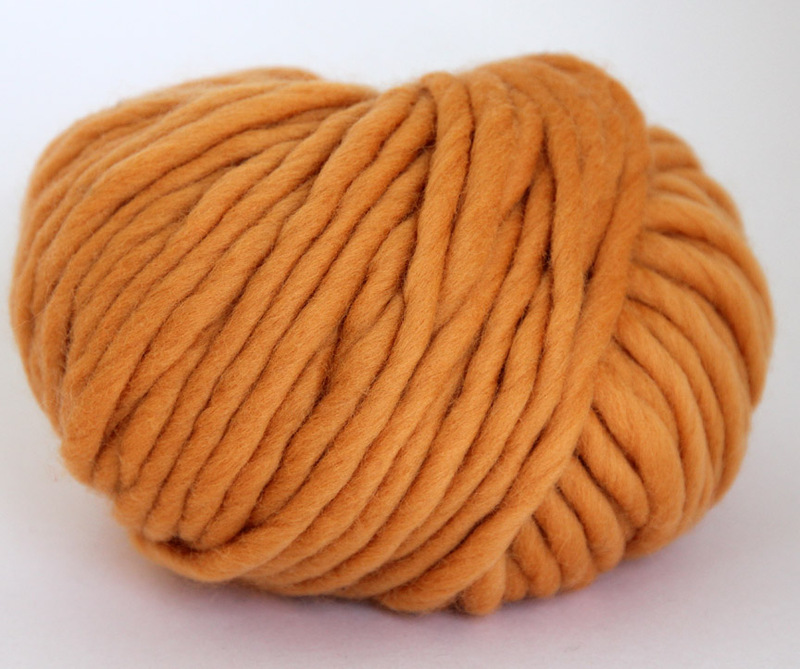 It holds the wool to reduce accidents; we’ve all dropped our wool into the dye bath using pins and tongs! No more burning fingers in scalding water!! Sits in the water while you answer the phone or mix the next solution. 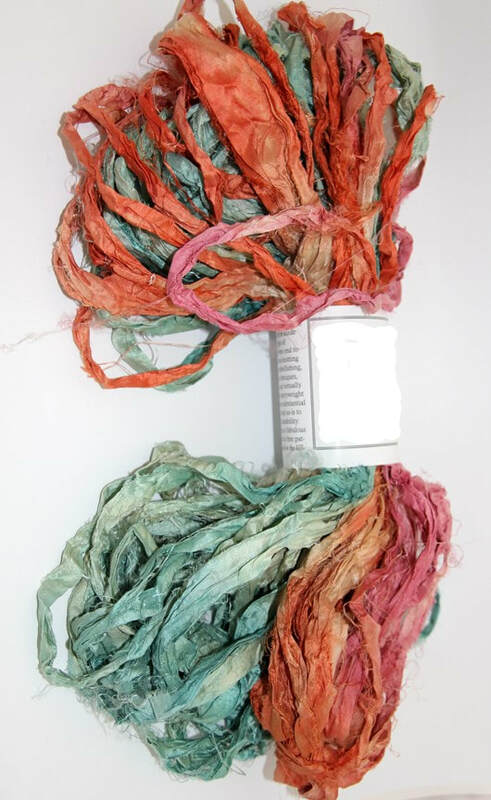 Like a rainbow in a bag, three feet of beautifully dyed roving in a range of colours. 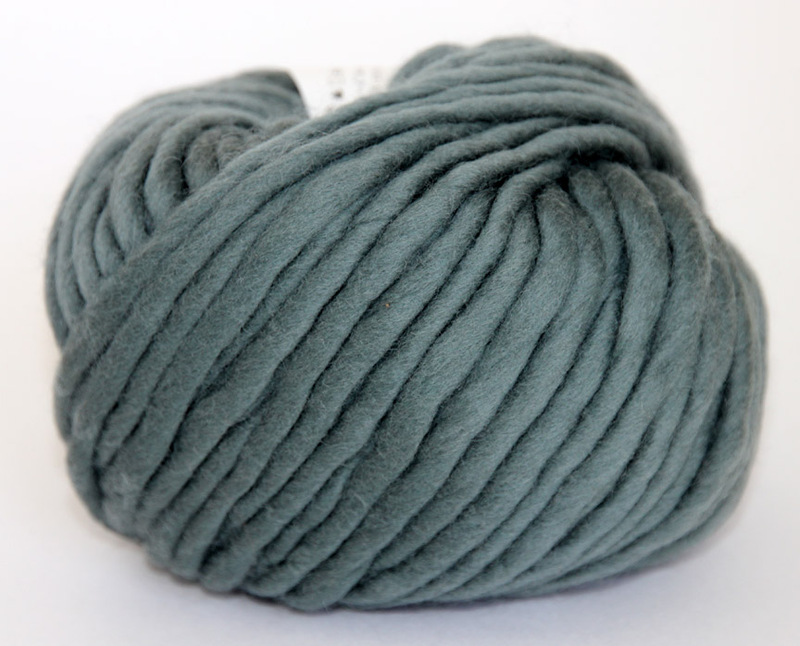 Lengths of wool top have been hand-dyed eleven tone-on-tone shades. 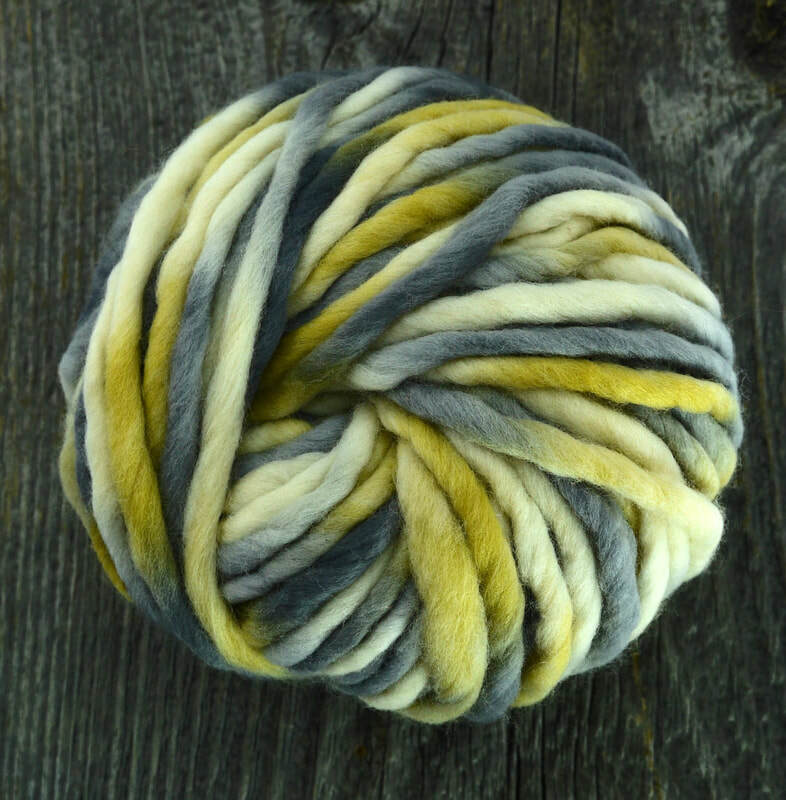 The camera doesn't do these wools justice. 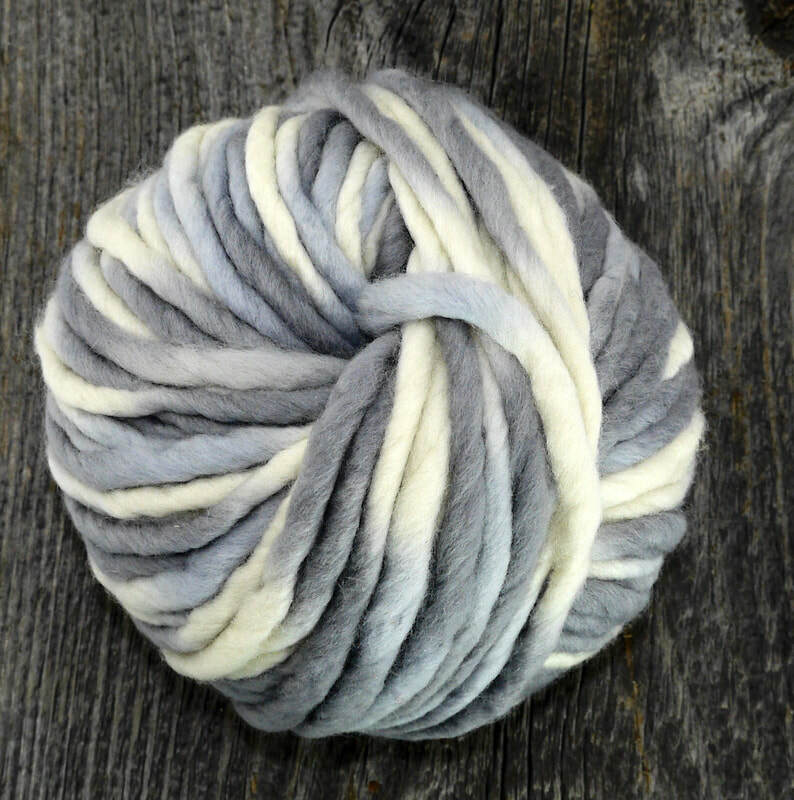 8 oz Hand-dyed Bluefaced Leicester Wool Top. 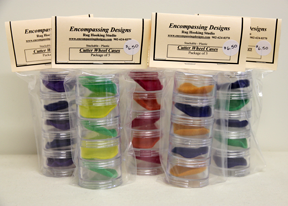 To use for rug hooking, needle felting or fondling! 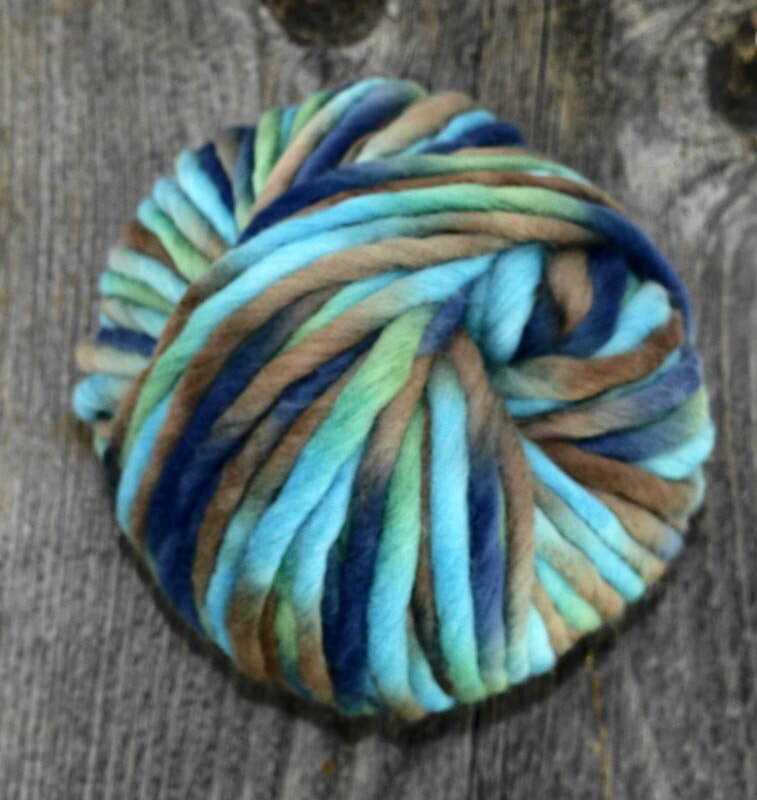 Beautiful soft Bluefaced Leicester roving with multiple colours in each braid. 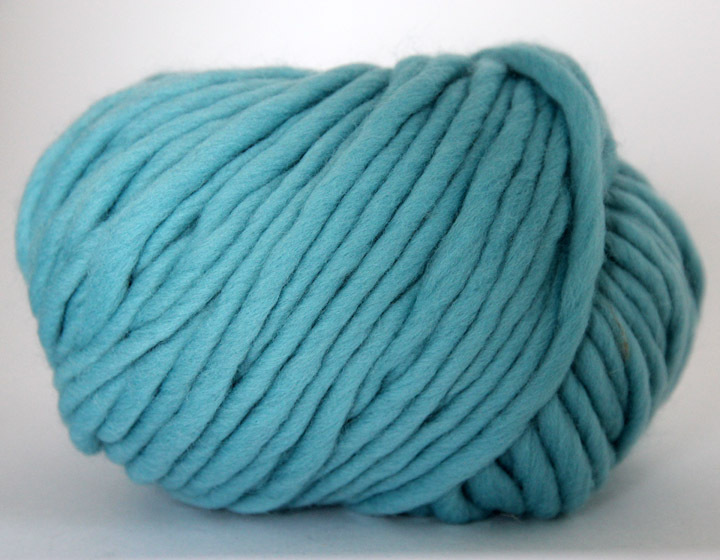 4.5 oz Comes in various colours. 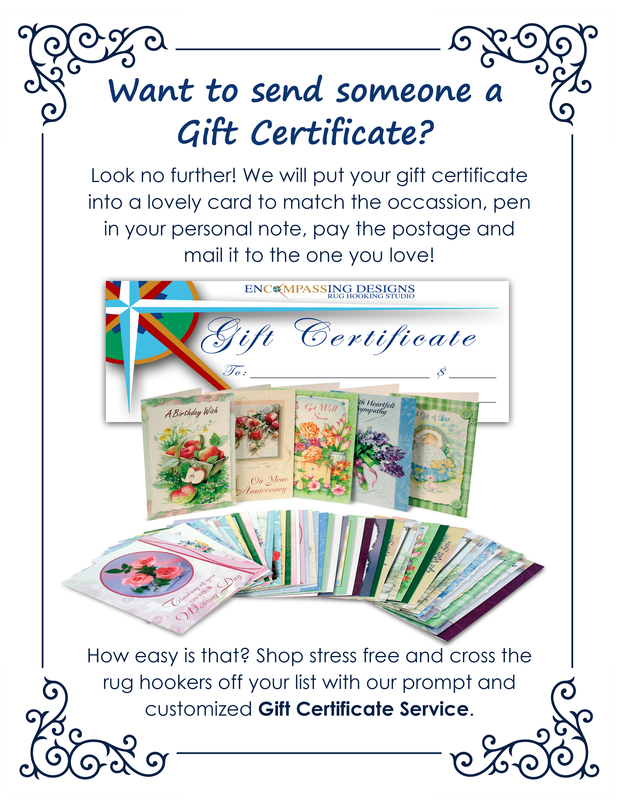 The perfect card to send to rug hooking friends back home! 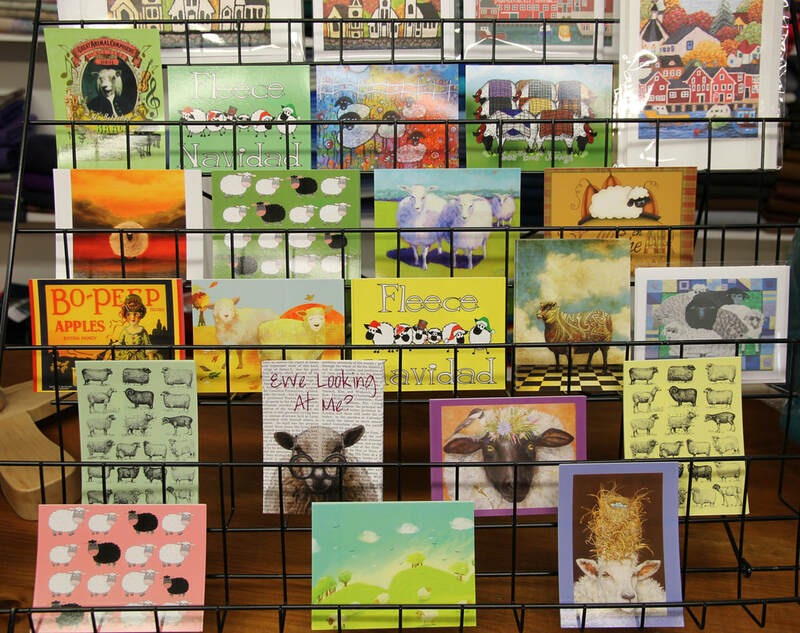 Size: 4 1/2" x 6 3/4"
Four high quality printed art postcards to choose from. Designed by Shane. 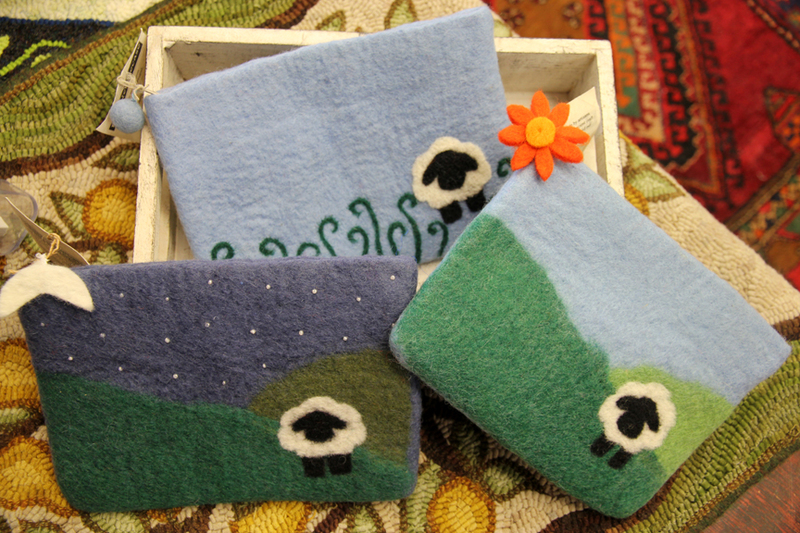 Wool Felted Bags perfect for carrying hooks and scissors! 3. Sunny Day Sheep with flower zipper pull. Mohair Boucle or commonly referred to as Curly Locks. 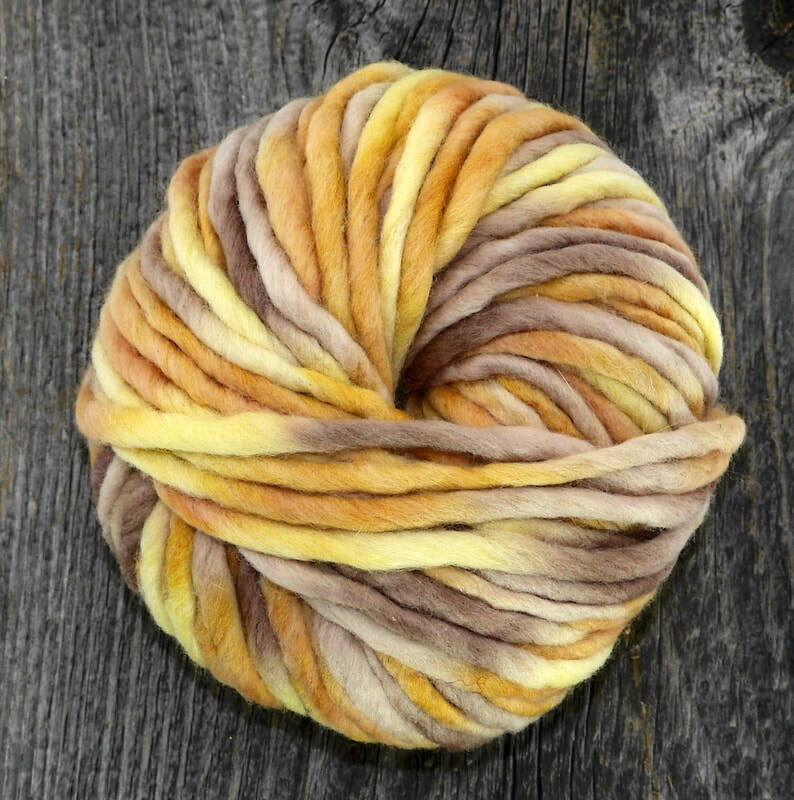 Sold by the skein or by the package. Great for Santa beards, crests of waves, sheep and so much more. Bent Stainless scissors. Great for sculpting projects. Shiny and sharp! Bent Ice Steel Scissors. Dull finish. Makes the perfect cut! Sharp! Ouch! Roving by the bag. Five ply. Perfect for sheep, clouds, waves, Santa beards, hair. 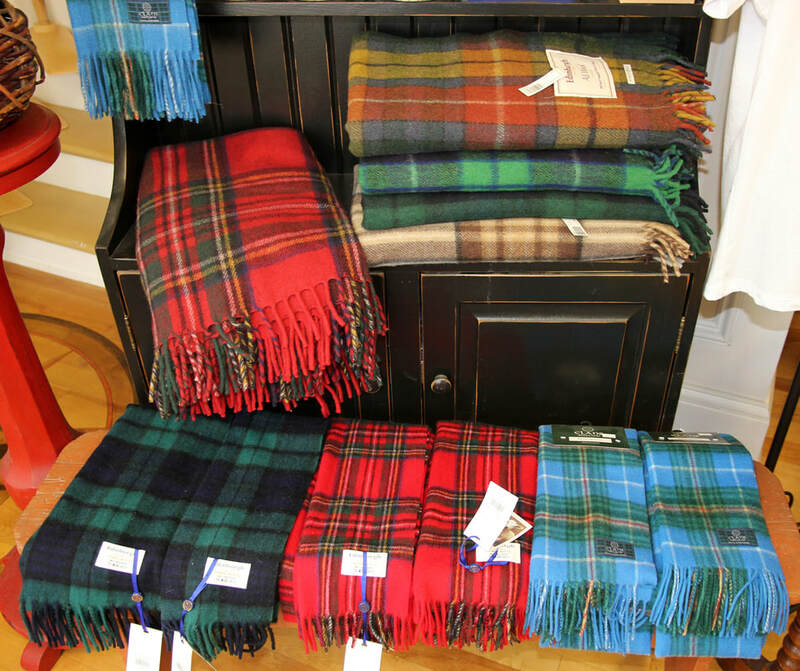 Comes in Natural, light brown, light grey, charcoal, black, red, gold, blue, green, navy. Rug binding sold by the roll. 1 1/4" wide, cotton. 72 yards on each roll. 100% cotton. Various colours available. Ask what is in stock. The best invention since sliced bread! 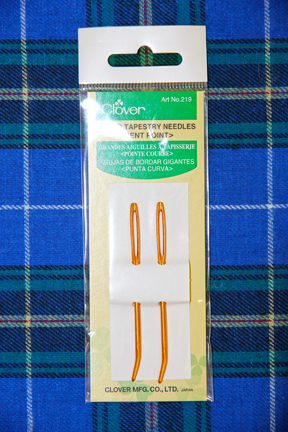 These needles are easy to thread, easy to hold and make the holes in the backing larger so the yarn doesn't bunch and knot up. The only complaint is that friends borrow them and don't bring them back. 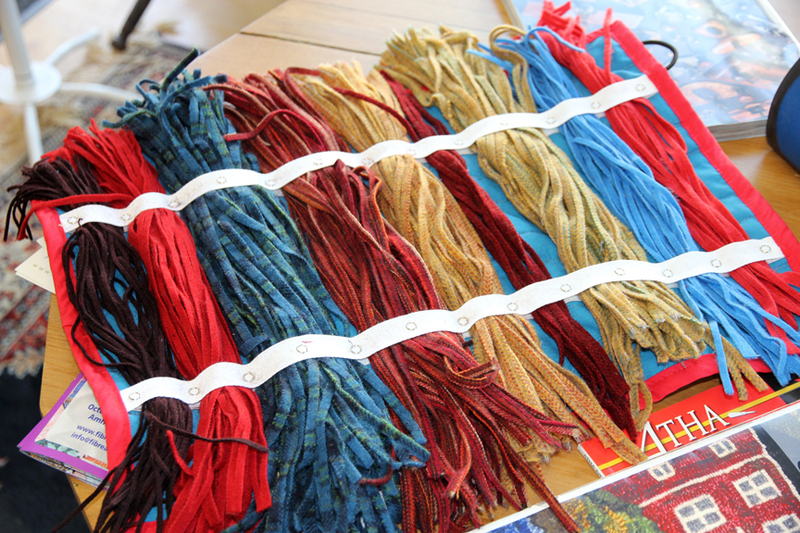 Very large assortment of rug binding colours always in stock. Sold by the yard. 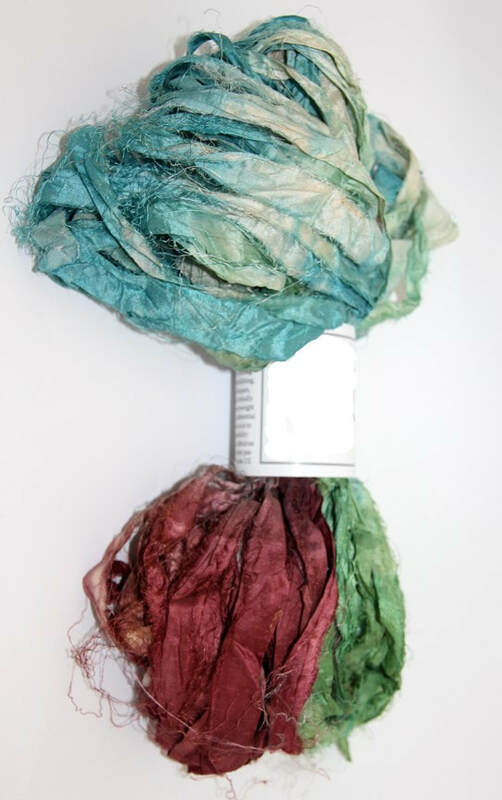 Dyed Roving Bits to add interest to your hooking project. Large assortment available. 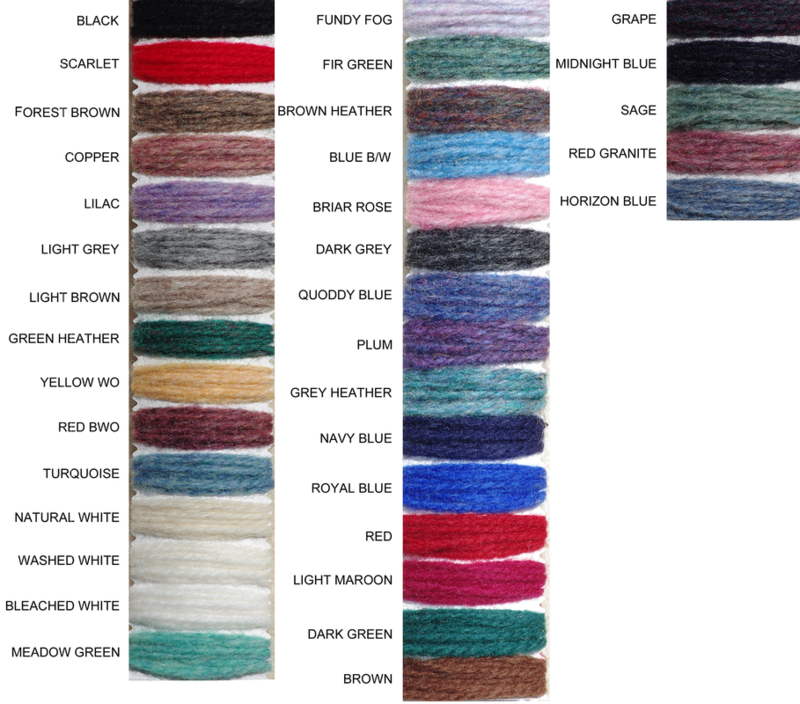 Tell us the colours you like and we will hand pick them for you. 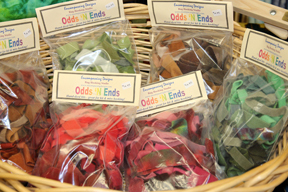 ​Bags of leftover ends are sorted by colour and bagged. No seam edges. 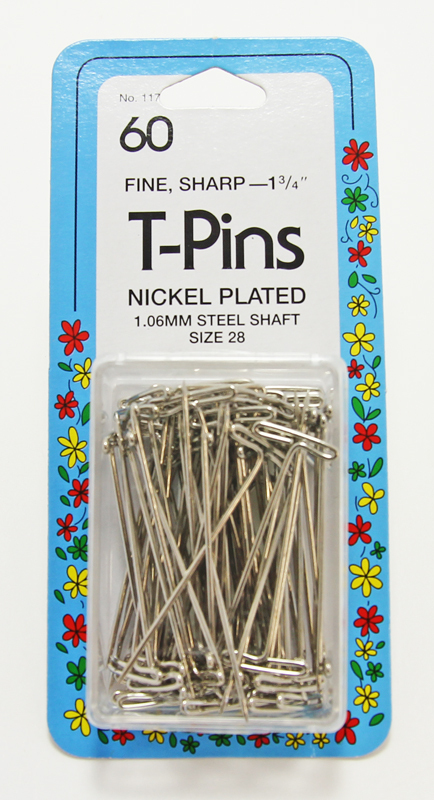 Great for hit and miss projects. 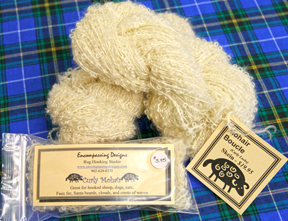 All colours not always available as the wool is leftover from making kits. 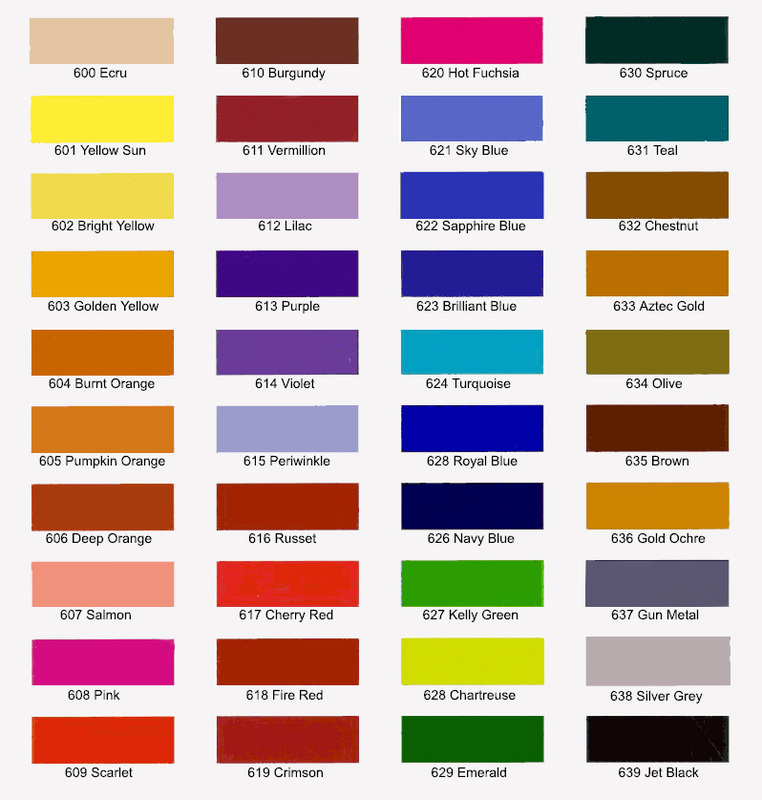 Usually there are blues, reds, yellows and greens as they are most commonly used. Approx. 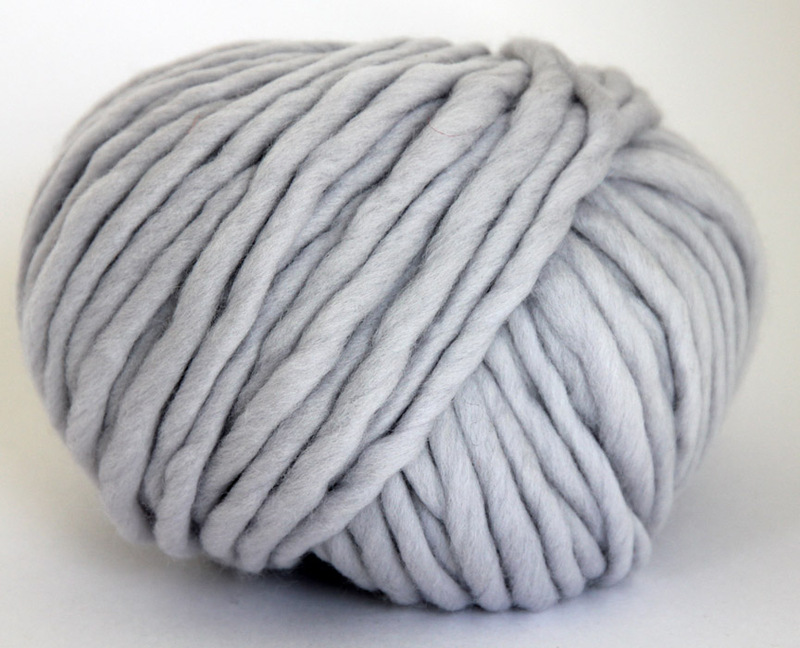 1/2 lb of wool. Size: 16" x 16" - $15.95 ea. Size: 14" x 20" - $20.95 ea. Size: 12" x 18" - $18.95 ea. Size: 14" x 24" - $24.95 ea. 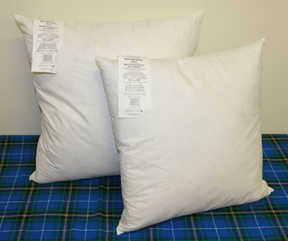 Size: 18" x 18" - $19.95 ea. Size: 22" x 22" - $28.95 ea. any rug that needs a bit of punch. 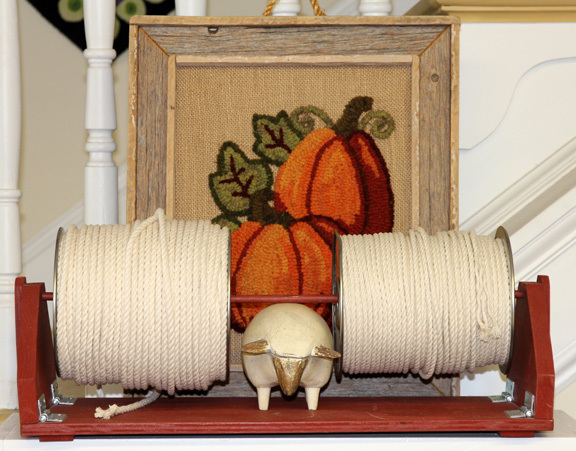 ﻿A great way to organize your wool strips while hooking. There are three arms that will separate your six values and the remaining three arms will separate your larger cuts. Beautifully turned spool and finished to show the luster of the wood. 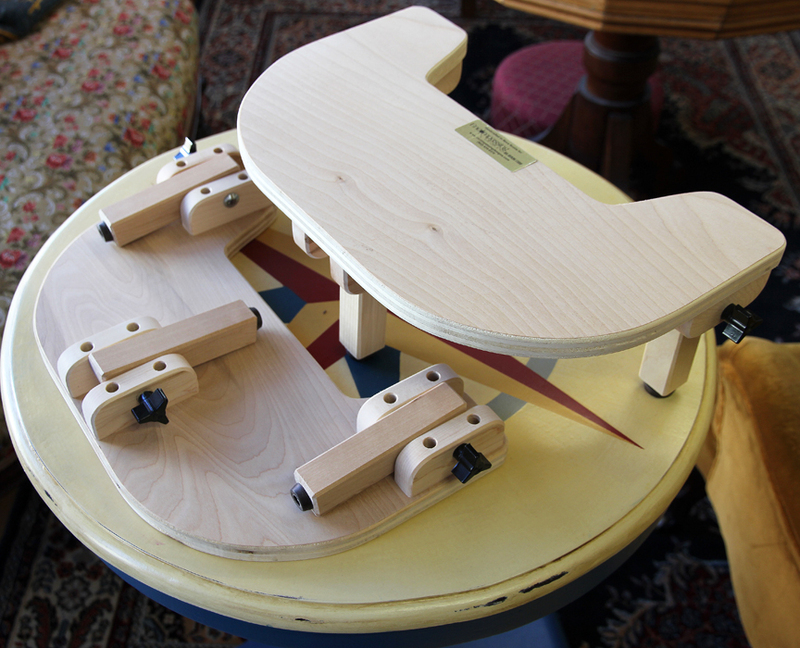 Little rubber feet will not scratch your table or slip. So professional and beautifully made it is a piece of functional art! Top part comes off for travel. Stackable cases to hold cutter blades. Each layer has a piece of felt to protect the blade from moving around. Clear plastic to identify the blade size at a glance. Each spoon has a measure on either end. They consist of 1/28, 1/64, 1/32, 1/16, 1/8 and 1/4. Highly polished steel. 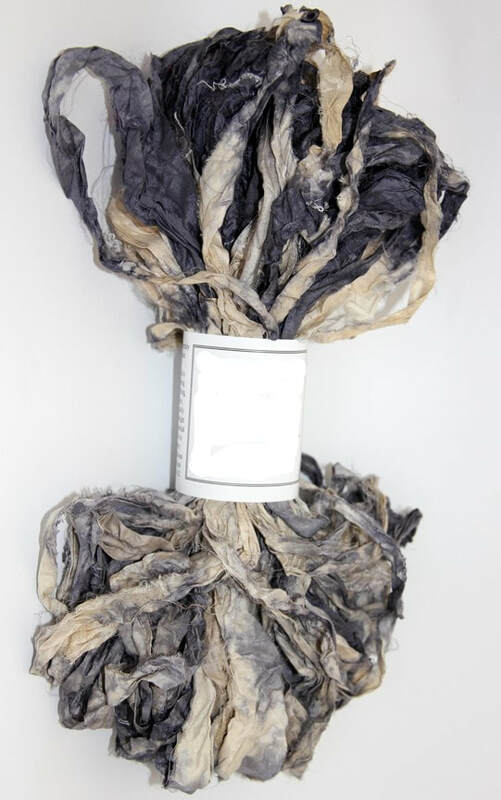 Stored in a plastic tube. 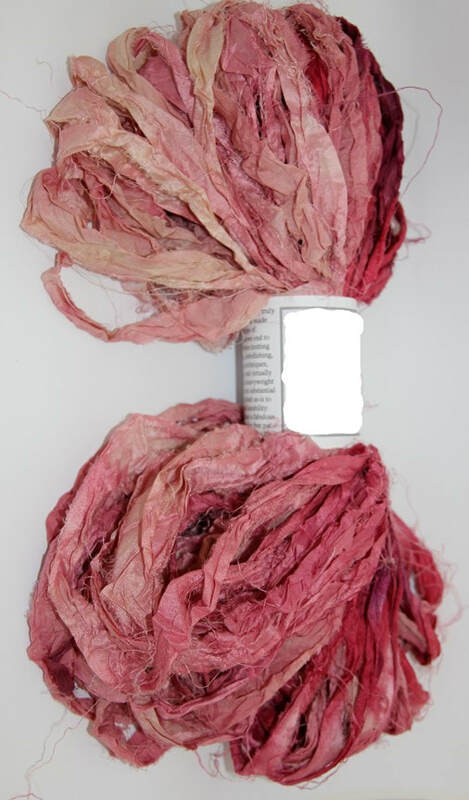 These are the dye spoons used to dye the wool for the shop and our dye book formulas. Not all dye spoons are calibrated properly. These spoons are tried and true. 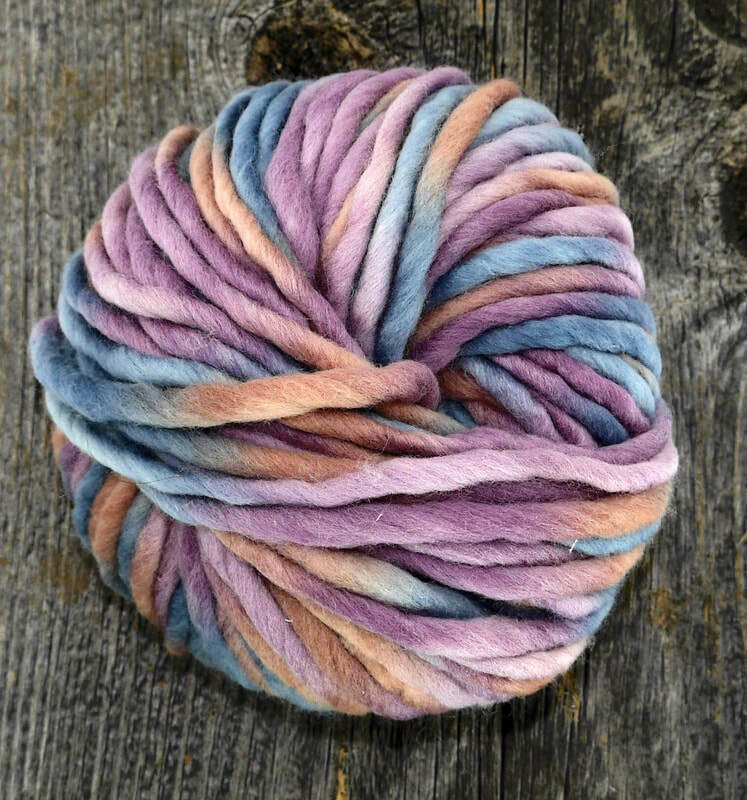 Very nice sized colour wheel to aid in dyeing. ​Grippers by the roll. 40" - 42" long. 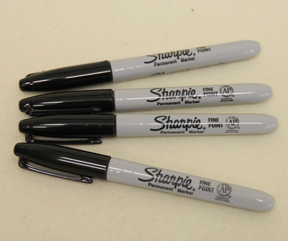 These are the grippers that work best with all the backings. 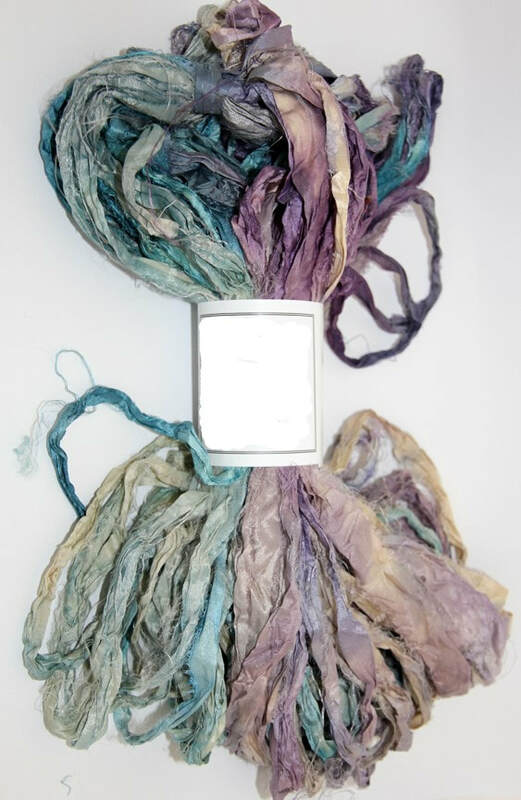 Extremely brilliant and colorfast, Jacquard’s Acid Dyes are concentrated, powdered, hot water dyes that yield the most vibrant results possible for protein fibers. 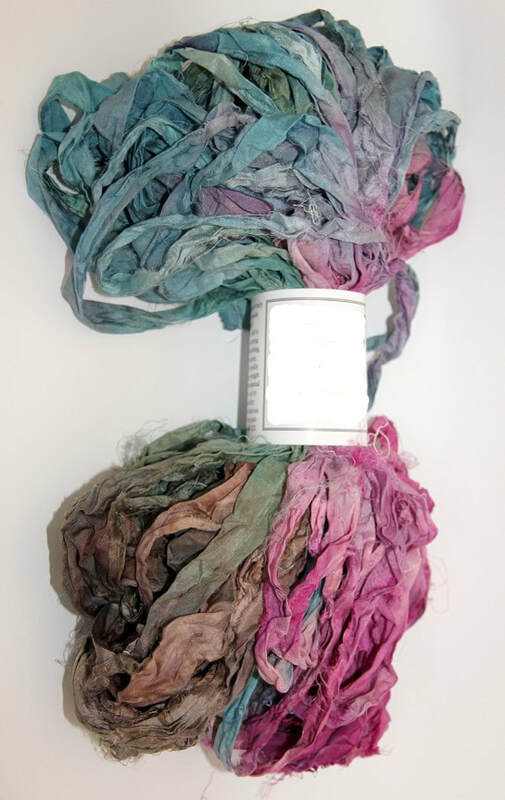 When immersion dyeing, Jacquard’s Acid Dyes produce a uniform color, which is always a challenge for dyers. The colors are beautiful, transparent and luscious enough to dive into! 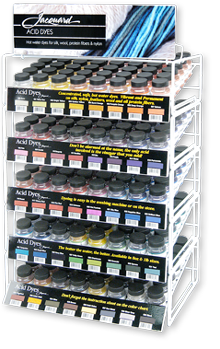 Choose from 40 different colours! Handmade scissor bling by Christine Little. As individual as you are! The bling will help identify your scissors at a hook-in or help find them when lost in the sofa cushions. 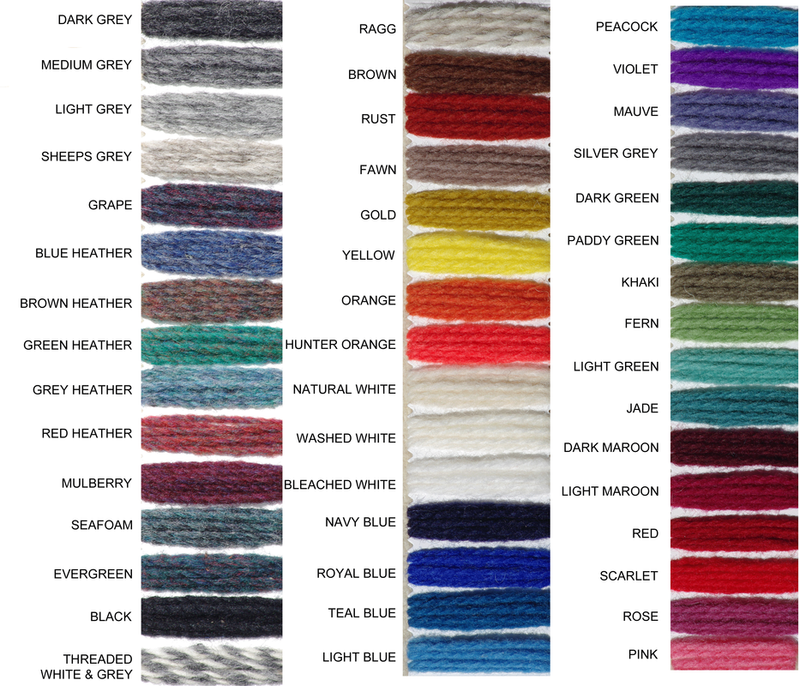 No two are the same, with many colours available or we will make up one to suit your request. 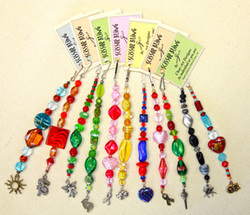 Bling clips to your scissor handle. Scissors sold separately. 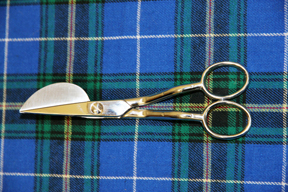 ​Buy a pair of scissors and get 50% off a scissor bling of your choice.